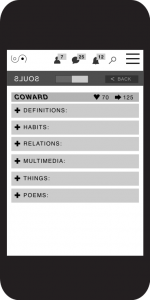 Souls is a proposed gamed app for knowing about yourself better in a very original way. Souls starts with different difficulty levels, and when you finish every stage or anytime you want to finish the play, you can get an interesting advice about your Souls. If you later decide to upload the results into an interactive free network, it should build a profile with a nick, and 3 adjectives for values offering and 3 for wanted values as an «About you», and the possibility of extending them with definitions, habits and other content you would like to relate to them. Language of Love app is useful for a better understanding and collective development of dual fuzzyness. Add an opposite adjective to the noun. Add a complementary noun. Add content to the composed concept. Nest groups of concepts, order a broader view of the whole. Get interpretations of your view, build common views. We all have defects and every bright has its shade. Sometimes focus a shade let you see the bright you need. *1. Pre-publishing: It gets published only when you have 2 likes. *2. Networking: and then publisher gets a Like and a Dislike. get a love and a dislike.